My poem for Literary Orphans Journal comes out Monday and I will share the link, and I just got one accepted into Hermes Poetry Magazine. My line was also accepted into the “Epic Protest Poem” going on. I also just received the proof pages for the Paragram Poetry Anthology where I was long-listed for the prize so I am in the anthology, and as I showed the cover of (Broken Atoms in our Hands), the other anthology I am in has been published. Nuclear Impact: Broken Atoms in Our Hands is now available on Amazon and Barnes & Noble. 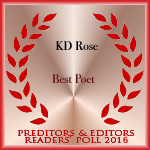 This is a compilation of poets of which I am one. All proceeds from sales will be donated to the Women’s Center in Downtown Los Angeles helping homeless women, some of whom are survivors of trafficking and abuse. So nothing to say but onward and upward! Today thru Sun! 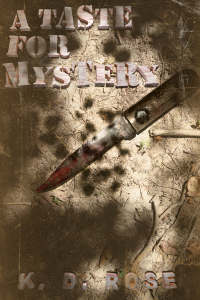 Download & Read A Taste For Mystery FREE! Mystery and Romance blend together when competing detectives Carolyn Woods and Jack Heart are both hired to solve a murder, only to realize they are working the same case. To complicate things, Carolyn and Jack have an on again, off again relationship. Then there is Evan Jones, a handsome architect— but he’s also a suspect. Can Carolyn solve the case as more and more murders pile up? Will her relationship with Jack hinder their investigations? And what about Evan Jones? He seems like the perfect man, but could he actually be the murderer? One thing is for sure: someone close to Carolyn and Jack has a taste for killing. Jack Heart drinks to excess daily. His apartment is in shambles, he’s isolated himself from all his friends, and he stumbles to the couch every night to sleep off an alcoholic stupor. All that changes when he receives a phone call with a job offer from a man he barely knew. Asked to go undercover in an elite business, Jack is thrown into the deep end and hasn’t a clue what he’s in for— or looking for— until he starts asking questions. Suddenly, Jack must track down an embezzler inside a swanky corporation riff with politics, game-playing, and treachery. The deeper Jack goes, the more dirt he finds. Can this out-of-place detective survive and still crack the case? Not to mention some of women he works with have plans for him—plans that are way more than he bargained for. One thing is certain: Jack’s taste for danger will take him to the edge of disaster.